On January 2004 I discovered an item to be sold by auction on the eBay site. I decided to bid on and finally I won it. One can read : " G.Cavey & Son Plumstead 1d" on the obverse. It is described as "English - tin penny traders token 25mm dia.aprx". The question is, what were these token made for ? I googled and found the explanations below. I provide them "as is", expecting that our English Cavey can give us more details about this tin money. Since I have writen the text below I have found several other tokens, which I already had, to be sold on eBay. One of the sellers wrote "This is an Interesting Antique Tin Store Token. Circa 1812. Measuring 2.3cm across. Stamped ' G. Cavey& Sons. Stores ½ D ' These tokens were privately issued to replace coins, between 1788 - 1796 and 1811 -1815." "Trade Token of Jonathan Tailcote of Saddington, Leicestershire, Tallow Chandler. Born 1635/40, buried 11 June 1713." "Money was so scarce about this time that principal traders of Towns passed tokens for the use of themselves and neighbours.The date of the earliest known is 1648, the latest 1672." (History of Leicester, Throsby, P.124)". "In the seventeenth century a vast number of traders’ tokens were made and used. Almost every, different occupation (business) is represented in this series. A major impetus for the production of these tokens was the tremendous increase in trade with goods being made for cash sale, but this coincided with a severe shortage of small denomination coins. Consequently traders issued their own small value coinage to be given as change when selling goods. At that period timber, used extensively in building houses, ships, household heating and industrial use to smelt metals, became short in supply and the extraction and use of coal for these purposes increased enormously, particularly in the middle of seventeenth century. This increase in the coal industry, however, does not appear to have led to the issue of tokens by large numbers of colliery owners. Very, very few are known, of which three are quite well recorded: a half penny at Broughton Coal Pits in Cumberland, a half penny at Middleton Coal Pits in Yorkshire and a half penny at High Peak Coal Mines in Derbyshire. Very little is known about Broughton Colliery in the seventeenth century although several other tokens exist for pits/collieries of that name in Cumberland. This token is unusual in that it is octagonal. It was issued by John Lamplugh in about 1670 and bears the legends;"
"During most of the eighteenth century, there was a chronic shortage of small change throughout Britain. This was usually because the mint could not or would not produce enough low value coins to satisfy demand. Quite why is not always clear. The situation was unique to the eighteenth century, there have been many times in the history of Britain and most countries, when there has been a shortage of coins in general and small change in particular. The situation was often alleviated by local issues, either individuals, traders or councils. These privately issued coins are generally known as "tokens". They usually had no official legal tender status, but were readily accepted because they were so desperately needed. The period from 1788 to 1796 produced prolific issues of tokens, with a further small spate between 1811 and 1815. Because of the great variety, the collecting of tokens is often more fascinating than that of coins. Many carried advertising for their issuers, and some were produced as "vanity" pieces. Because many of them were very attractive, it became fashionable to collect them, and some of the more artistic designs were made to sell to collectors. Quantities issued of these types were often very low, perhaps a hundred pieces. Most of the tokens were halfpennies, but pennies, farthings, and other denominations were also issued." Note that the Plumstead, the first item above refers, is not the Plumstead locate in Pennsylvania (US) but a London Suburb (see : Plumstead, 1800 – 1900 : The Building of a London Suburb and Plumstead Choral Society). 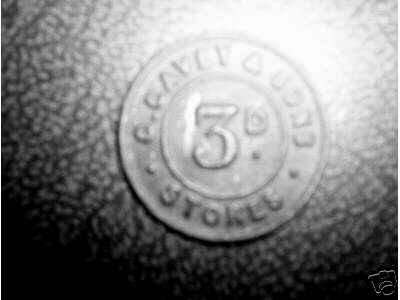 Since then I've found four other tokens form the same G. Cavey & Sons Store. The above pictures are about twice the actual size. This 3d token is from O. Cavey & Son stores. I don't know if "O. Cavey" was the father of "G Cavey" or if it is the contrary.